A week ago, I was in the south of Italy for the Radici del Sud festival to judge wines made from indigenous Italian grapes. Joining the likes of Jancis Robinson and Jeremy Parzen of DoBianchi.com, I explored a wide variety of styles and quality levels of wines from southern Italy, discovering amazing varieties like Minutolo, a fragrant white grape that could fool you into believing it was Gewurztraminer, and Gaglioppo whose combined richness and elegance excite the palate. Along with better known grapes such as Aglianico and Primitivo, both of which reconfirmed that the consumer should look outside their comfort zone when looking for crowdpleasing reds from lesser known regions. Today, however, I’m not here to talk about these grapes, but rather, a fun little sidenote about a chance encounter with Lello Tornatore, a passionate foodie who owns a country house called Tenuta Montelaura (warning music). After a brief introduction by one of my fellow judges at Radici del Sud, Ada Sguazzo, Ada promptly notified me that in Lello’s car sat a leg of “ham”; however, the “ham” was not made from pig, but rather from sheep, or in this case, ram. This immediately caught my attention after falling in love with a similar cured lamb product from Norway, called fenalår. Intrigued by its flavor, I quickly asked how we might taste it. So Ada, being a lady who knew how great this treasure is, immediately set out to find a location and a knife to ensure our group could get a taste of this true culinary treat. However, when she ran off, I honestly assumed that our chances of tasting the cured ram were slim to none, but never underestimate the determination of food loving Italian woman. It was only a short while later that we were hurried into the press room where both the leg and knife stood at the ready. Sometimes the best culinary moments happen when you least expect them. In this decadent 5 star resort, we found ourselves sitting on folding chairs huddled around the press table with printers and miscellaneous papers strewn across the table, while watching Lello hack into the gorgeous cured leg of mutton with a serrated steak knife. He laughed and suggested that this might not be the best way to get at the leg’s succulent inner core, but after catching a whiff of the pungent cured meat, we all forgave the misshaped chunks of lamb, digging ferociously into slice after slice like a pack of wolves. 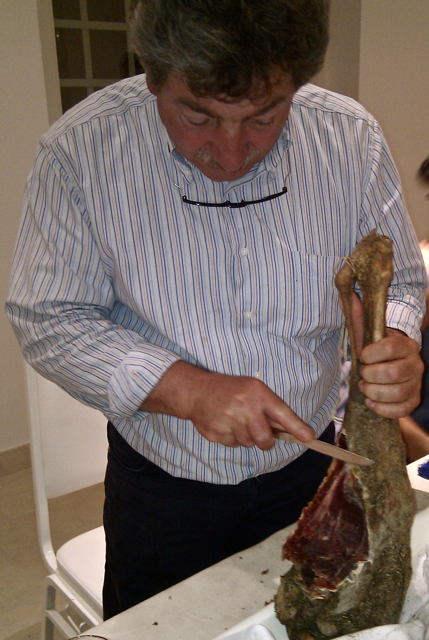 In Spain, lamb is a white meat, preferring to eat lamb that still relies on its mother’s milk. I’ve been told by some butchers that meat from anything over a 1 year old is inedible, something I know is not only incorrect, but also frustrating when you crave that rich lamb flavor that only comes from an older animal. Pungent and gamey some say, it’s what I love about lamb, and this particular lamb was all that and more. From a 5 year old ram, cured for 6-8 months, it was a treasure to be exalted. Lello explained that he only just had finished perfecting his own recipe, making around 5-10 legs a year, while reserving them for friends and family on special occasions. I’m not sure how this qualified as special, but it will go down on my list as one of the greatest things to pass my lips. 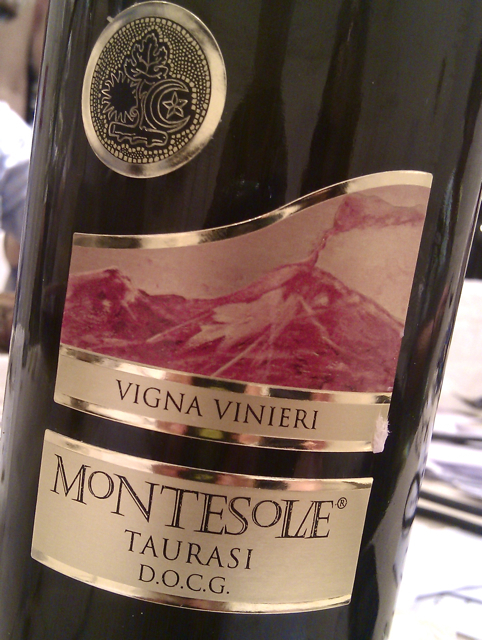 Wines were poured, and due to the numerous diverse wines that I tried, I can’t say one thing worked best; however, I would most likely recommend a strong Aglianico like the one brought by Michael D’Argenio, winemaker at Montesole in Taurasi: it’s richness not getting lost in the rich meat we picked at. The night ended when we couldn’t scrape anymore meat away from the bone with our dull knife, though another one of the diners quickly snapped up the remaining bone to further dissect it back at home. The rest of us were still a bit hungry since this amounted to our evening meal, but I believe most of us were happy to end the night with this distinct flavor in our mouths, rather than pollute them with anything else. Fortunately for all of us the Italian wine blogger Luciano Pignataro has done a nice write up about how this ham is made. The recipe in English and in Italian.